Even if the entire treatment was impeccably performed and the care and maintenance measures thoroughly conducted, risks or complications are not out of the question. After all, nothing lasts forever and very few procedures in dentistry will last a lifetime. Even though the huge technical advances have significantly improved the quality of dental treatments, accidents and complications may still occur and it is very good to be aware of this. finally, some of the more serious conditions will require the permanent removal of the prosthetic device and sometimes an entirely new treatment plan has to be devised. 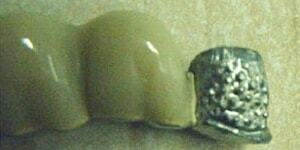 Sometimes, a dental crown or bridge may fell of the abutment teeth. Crowns and bridges can become detached for a number of reasons. The most common ones are biting down onto a hard piece of food or simply because of the length of time they have been worn. Another variation is that a dental restoration becomes loose, mainly because the cement washes out from under the crowns. In both cases, it is essential that patients contact the dentist's office as soon as possible. The worst scenario is when patients take the matter into their own hand and try to re-attach the restoration using various types of "glues" (which can severely damage the underneath teeth). It is equally bad to do nothing when the patient feels that the restoration became loose. A loose dental crown involves the dissolution of the cement around the abutment tooth; hence, the bacteria can penetrate in the empty space leading to various infections of the dental tissues (pulpitis, periodontitis). 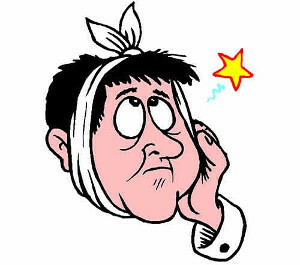 At the dental office, the practitioner will assess the situation: if the restoration is not damaged (fractured, chipped etc.) and all abutment teeth are healthy (or, in the worst case, a conservative treatment is possible) the dental crown (or bridge) is re-cemented on the abutment teeth using a permanent dental cement. Some of these symptoms may arise after a new restoration is permanently cemented. Most often, these reactions go away after several days (sometimes weeks) or after simple procedures performed at the dental office (see follow up). The complicated problems emerge when the symptoms arise after a reasonable period of time has passed since the definitive cementation. The main problem is that pain is a symptom that is differently perceived by each individual. Besides that, pain can radiate from one place to another making the diagnosis even more complicated. Various types of pain may occur after a dental restoration is definitively cemented. Sometimes, the pain can go away after a period of time. In every situation, it is advisable to contact the dentist as soon as possible. The cause of the pain can be determined after a careful examination and, in most of the cases, a dental X-ray. Endodontic therapy if the pain is caused by a pulp inflammation or inflammation of the periapical tissue (located underneath the tooth). A bite adjustment if the restoration was left too high. Normally, in these situations, the pain is felt when biting down on something or in the jaw muscles and mandibular joints. Sometimes, a conservatory treatment is no longer possible. These cases involve the permanent removal of the restoration, the extraction of the affected teeth and a new reconstruction plan. Crowns and bridges made of porcelain can sometimes chip. This usually happens after biting down on a harsh piece of food. The appropriate treatment depends on the extent of the fracture. 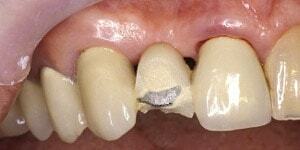 If the chip is small, a composite resin can be used to repair the chip with the crown remaining in the mouth. Specific "ceramic repair" kits are available. These kits contain, besides composite materials of various shades, specific gels that help the composite materials to be held in place. If the chipping is extensive and a significant amount of porcelain was lost, the best solution is to reconstruct the entire prosthetic device. There are situations when dental crowns are constructed with a partial veneer that covers only the aspects of the crown that are visible. 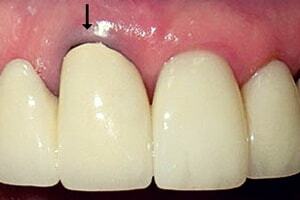 Sometimes, the partial veneers can detach as one piece or they can fracture. If the veneers detach as one piece, in some cases, they can be re-attached at the dental office. It is a relatively good option even if the connection with the metal frame is not as strong as the one created at the dental laboratory. Sometimes, for various reasons, the partial veneers cannot be reattached (veneers are fractured into several pieces, veneers are lost, the metal frame is also damaged etc). In this case, the entire restoration has to be removed and a new one will be constructed. It is advisable to opt for a higher quality restoration (porcelain, zirconium). If the patient cannot afford the reconstruction of the entire prosthetic device, another solution is available: a light-curing composite veneer can be manufactured and attached at the dental office. Normally, this is a temporary solution until the patient is able to afford a new restoration. Gingival recession implies the retraction of the gingival margin from the crown of the teeth. In case of dental crowns, the process leaves the margin of the crown and sometimes a part of the tooth's root exposed. This will produce an unsightly image. A dark line next to the gum line may become visible if the restoration has a base metal frame (image below). The most common cause of gingival recession is gingivitis. 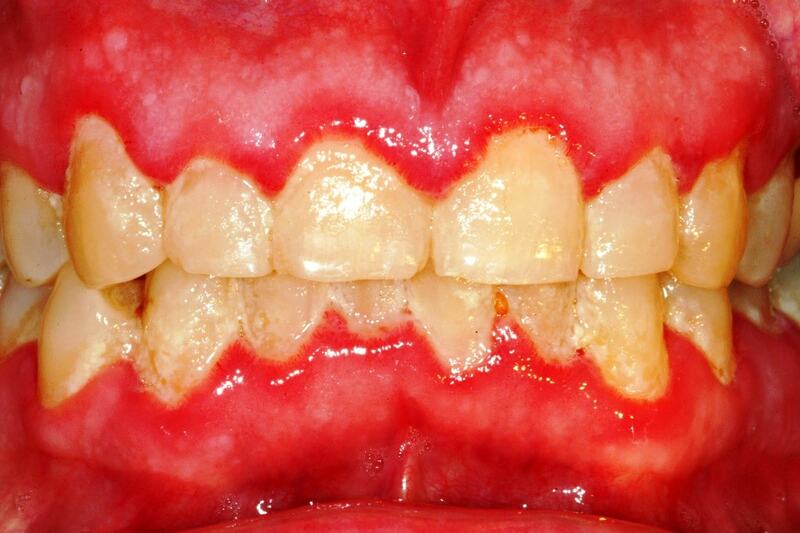 Gingivitis is an inflammatory disease of the gums mainly caused by an improper oral hygiene. In this case, other signs are also visible: swollen red gums, bleeding gums, bad breath etc. Crowns can attract dental plaque that can be difficult to remove. If plaque builds at the gum line, patients can develop gingivitis and even periodontal disease. However, when gingival recession is not accompanied by other inflammatory signs, sometimes it can be considered a physiological process that comes with aging. If a restoration is more than 10 years old and gingival recession is present, you may consider replacing the restoration.